Another amazing dessert entry in the 2014 Godiva Chocolate Challenge competition. Danny's dessert is an adventurous take on a chocolate tartlet that ‘dares to be different’ by adding some bacon to the mix. Yes, bacon and pork scratchings too! Whenever I think of chocolate, for some reason I always hark back to Charlie and the Chocolate Factory. Not the book but the film. And not the film with Johnny Depp and his eerie rictus grin but the original slightly twisted and dark version born out of the Seventies, starring Gene Wilder and that boy who never amounted to anything else. It’s the start of the movie that made the biggest impression on me, where the opening credits show hundreds of chocolate bars rattling through a production line. Cocoa beans get scattered down pipes; chocolate buttons and shapes cascade over steel trays; vats of molten sweet lava bubble and steam in the background; and biscuits and wafers trundle along conveyor belts and get smothered in glorious liquid brown chocolate. The impact that sequence made on me when I was a kid was something else I can tell you. Even the electric shock I got from dust and static after licking the television screen didn’t put me off. Making chocolate and working with it looked like this wonderful, gorgeous, magical thing. Although as a child, I would probably argue that eating chocolate was even better. Having played around with a lot of chocolate in the kitchen lately, I would still argue that eating the stuff was better than cooking with it because trying to coming up with a humdinger of a dish for the 2014 Godiva Chocolate Challenge has been slightly fraught. Chocolate, though glorious, can be unforgiving sometimes and when tempering chocolate, there is a clue in the name of this particular technique as to what can happen. As such, on a couple of occasions, bowls of grainy, crystallised gloop have been plonked down in front of happy children whilst Dad goes off and shouts at himself at the bottom of the garden. But I think I got there with this adventurous take on a chocolate tartlet that ‘dares to be different’ by adding some bacon to the mix. Yes, bacon. Actually, pairing cured rashers of pig with chocolate isn’t too much of a stretch of the imagination these days what with the advent of bacon jam and I hear that you can find bars of luxury chocolate flavoured with streaky on some shop shelves. However, in my self-absorbed opinion, what sets this dessert apart is the addition of a pork scratching snap. Admittedly, this is an idea half-inched from fellow food blogger Zoe Perrett who shoved a slab of chocolate-coated crackling under my nose at a supper club recently. But I reckon my shard of caramel, delicately flavoured with desiccated pork fat, is slightly more refined. In fact, the addition of bacon doesn’t overpower this dish at all. There is still that decadent hit of bitter cacao, delivering those flavonoids which contract the pupils in your eyeballs. But with the addition of salty sweet bacon nuggets into the mix, I do sincerely believe that this dish goes into warp overdrive. Could this be a dessert straight off the Willy Wonka production line? I like to think so. Find out more about the 2015 Godiva Chocolate Challenge. 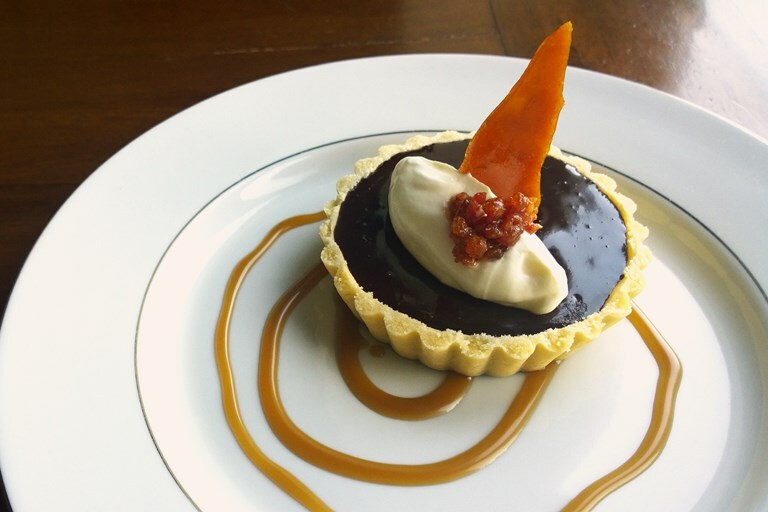 To serve, drizzle the caramel sauce over your plate of choice, place the chocolate tart on top, add a quenelle of crème fraiche and a shard of the pork scratching snap and then dot a small spoonful of the remaining candied bacon onto the crème fraiche. Enjoy!